It is the halfway point of fantasy football's regular season. There have been some big time waiver wire adds this season, and more to come. Make sure that your team is on the bleeding edge of fantasy knowledge with the week 8 waiver wire picks. Nobody is confusing Mayfield for an elite option at this point in his career. He is going to be up and down, as all rookie quarterbacks are. For the next couple of weeks at least, there should be more up than down. He faces the Steelers, Chiefs and Falcons before the bye week. That should equal some very solid fantasy production. It has not quite been a full-blown renaissance for Joe Flacco, but he has been very solid this year. He has put up at least 20 fantasy points in more than half of the Ravens games. With the additions of John Brown, Michael Crabtree and two talented rookie tight ends, Baltimore has a viable passing game. Martin was elite at one time, now he could be worth a flex spot. 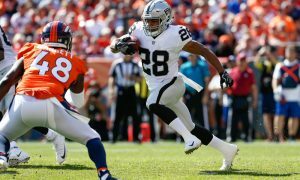 It looks like Martin will have every opportunity to claim a big share of the Raiders run game. Now that Lynch is done for the season, Martin is best suited to being an every down back. He is not a GOOD every down back, maybe not even average, but the touches will be there. Sometimes, that is enough for fantasy production. Based on past production, it would make sense for Jones to be seeing about 20 touches per game. Mike McCarthy hates fantasy football and winning, so that has not been the case so far. I still feel like Jones' talent level is too high for him not to be on rosters in all leagues. Grab this guy and hope that his coach wakes up. The Falcons want Tevin Coleman to be the starter for now, but Smith is still getting some run. He is probably going to be capped around ten carries per game, but that could be flex-worthy for now. When the Falcons offense is clicking, which it does most of the time, Smith is a nice bet for a score. Alright so I was incredibly wrong about Alfred Morris when McKinnon went down. I thought that he would be the man and instead he has been a colossal disappointment. Mostert, on the other hand, looks like a special talent running the ball. he has not really had a chance to how his skills until week 6 when he went for 87 yards on 12 carries. Now that Breida is even more banged up, I would bank on more Mostert. If you miss out on Doug Martin, Richard could be a solid second choice. While I think that Martin should be the starter, Richard is more explosive and a better pass catcher. There is a chance that he outplays Martin thoroughly enough to take over the backfield at some point. I just can't quit this guy. A new quarterback may give new life to Benjamin. 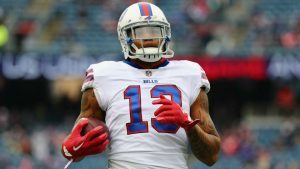 The Bills and Benjamin have been disastrous this season and that will continue, for the team at least. Things may turn around a bit for Benjamin as long as Derek Anderson starts. He has a nice rapport with his big receiver as KB went for 71 yards on 4 grabs. I would not expect him to set the world on fire, but Benjamin could be a very nice fill in until Josh Allen gets healthy. With no number one receiver in Dallas, Beasley is a tough sell for fantasy. He can have a nice outlier week here and there, but that is his ceiling. While I do not think that Amari Cooper is a high end number one, he will draw some coverage. Having an NFL caliber receiver on the roster should open things up a bit for the other receiving options. Most people (myself included) gave up on Parker a long time ago, but the Dolphins are running out of options. Coach Adam Gase feels this acutely as he was quoted saying, "We don't have any more receivers, so I'm sure he's going to play." A ringing endorsement. Like Doug Martin, Parker will have plenty of opportunities and that is worth more than talent sometimes. The Bengals are short-staffed and Uzomah is one of their healthy pass catchers. That has been enough to get him in fantasy lineups for the last couple of weeks. This week, you can add the fact that they are playing Tampa Bay and their awful defense. It looks like Gio Bernard could come back and steal some touches, but the Bengals should not have trouble putting up points in this one. Be sure to come back tomorrow and check out our weekly positional rankings. Follow me on Twitter for some extra insights and analysis as well as questions answered: @brendancole16.